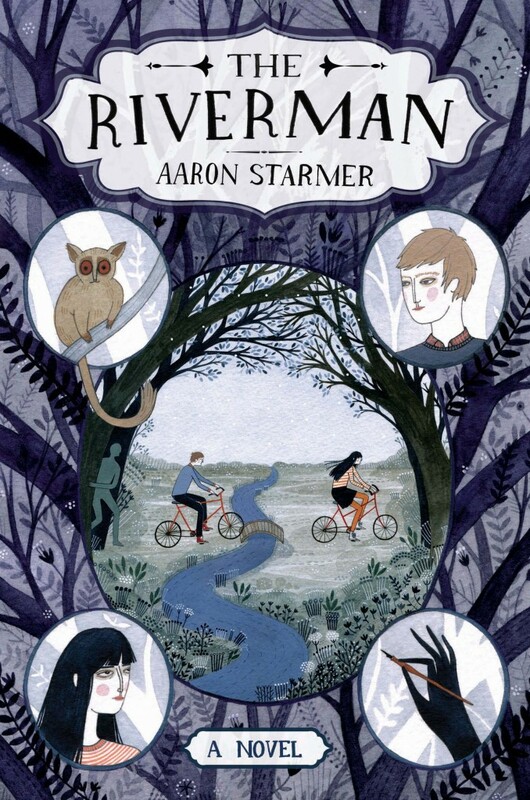 Aaron Starmer, The Riverman (2014). In upstate New York, near the Canadian border, Alistair Cleary lives a normal life of taking dangerous dares and avoiding nosy neighbors. Then Fiona Loomis, not yet 13, asks him to write her biography. She tells him about an alternative world called Aquavania, accessible only through a special portal, where inhabitants essentially create their ideal environments. But with one drawback: the Riverman gradually collects the children who live there — accounting for some who have disappeared from the world we know. Alistair has to decide if Fiona’s imagination has taken her too far. How could such a world exist? And yet — there are moments from Alistair’s past that suggest she might be telling the truth. Creepy and satisfying, and its ending (implying a sequel) sent me straight to Ray Bradbury’s Something Wicked This Way Comes for closure. 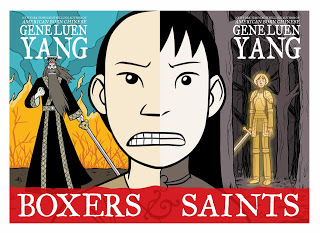 Gene Luen Yang, Boxers and Saints (2013). China’s Boxer Rebellion at the turn of the 20th Century doesn’t strike me as food for YA lit, yet Yang has created two graphic novels set in this turbulent period of China’s history that grabbed me by the neck and dragged me through relentlessly searing scenes. During the waning years of the Qing Dynasty, missionaries and other Europeans arrive in China, bringing the religion and opium that threaten to destroy local culture and political stability. In the first volume, Little Bao, incensed by the missionaries’ destructive practices, leaves his village to lead the Boxer Rebellion, and in the second, Four-Girl abandons her cruel family to help a missionary set up a church. Mystical elements abound: Chinese gods and heroes help Little Bao and his army, and Joan of Arc inspires Four-Girl to seek the will of God. Bao and Four-Girl cross paths a couple of times, seemingly to no one’s benefit. Yang doesn’t gloss over the violent atrocities perpetrated by both sides — massacres abound, and the muted colors of his drawings are often splashed with blood. Read Boxers first, for the fullest impact. Joan Aiken, The Monkey’s Wedding and Other Stories (2011). 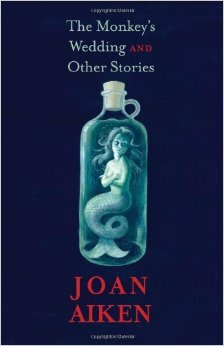 I don’t know how I missed growing up with Joan Aiken’s stories, but I’m happy to have discovered her at last. The stories in this collection date from as early as 1956, and several are published here for the first time. With a mixture of reality and fantasy (a gift of a mermaid causes friction, visions of octopi haunt a character), Aiken explores marriage, family relationships, independence, and regrets. Her language never fails to amuse. One woman has “a flat, square face like the back end of a tin loaf”. Mice approach a character “with caution … but with dignity, pausing at her slightest movement, putting their heads together as if they conferred, and then nimbling on again.” Nimbling! A quick peek at the OED shows Aiken didn’t invent this word, and serves only to underscore her amazing vocabulary. It perfectly describes what mice do, and now I need to write something in which I can use that word. One more thing: remember all those writers’ advice columns that tell us to eschew the adjective and adverb? Well, take a look at this sentence: “An aged Ford, lurching through the early winter dusk, which was partly mist, brought him to a large red-brick house, set baldly in the middle of a field.” Take out the five words I underlined (nearly 20% of the sentence) and you’re left with writing that limps along. Keep them, and the image to illustrate this page is in your head. 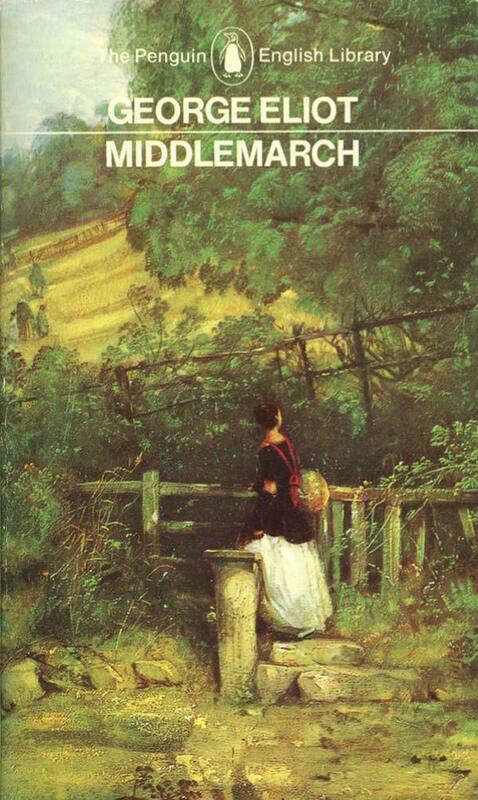 George Eliot, Middlemarch (1871-72). I hope I don’t need to say much about this, considered by many to be the best English-language novel of all time. I’ve read it once every decade since the 1980s, and hope to squeeze in 2-3 more readings before what my father calls “the inevitable.” Eliot’s world, worth several visits, is rich with historical detail, the inner lives of her characters fully limned — so much so that many readers find the book ponderous and dead. Anyone who prefers non-stop action will not enjoy this book. But if you want to understand the choices people must make in order to live a useful life, then the stories of Dorothea’s disastrous marriage to Casaubon, of Dr. Lydgate’s downfall, and of Fred’s rescue from a debauched life will satisfy again and again. Two additional summer books deserve separate posts, so watch for coming reviews of Rief Larsen’s T. S. Spivet and, at long last, W. G. Sebald’s Rings of Saturn. This entry was posted in Adventure, Classic, Graphic Novel, Historical fiction, short stories, YA Lit and tagged Aaron Starmer, Gene Luen Yang, George Eliot, Joan Aiken. Bookmark the permalink. Aiken’s writing is always a pleasure. I feel I’ve discovered a new country, one already inhabited, but new to me.